Tues. Sept 11th. 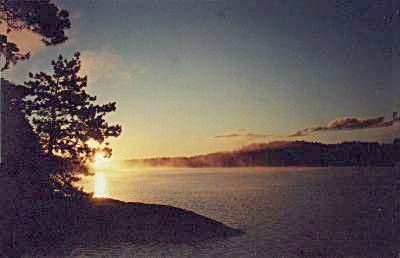  13C  At 6 am the loons bantered back and forth, their haunting wails rebounding between the distant fog-shrouded hills and coves. At the far end of the lake, a blazing sun arose just as the fog lifted its cover. We were well aware that the lakes and portages to Threenarrows Lake would entail a great undertaking, so we indulged in a good breakfast and a refreshing swim before decamping our site. At 9:30 am, we found ourselves paddling across a tranquil Great Mountain Lake. We glided by a well-kept cottage on a point overlooking the western vistas of the lake. Entering the southern sector of the lake, we were met by high rock cliffs that half encircled its bay. At the portage (10P60) to Little Mountain Lake, John and Norm R. took out on the right side of the small cove, not knowing that they would have to cross a small, rocky stream to reach the portage. This short trail tested our balance, strength and endurance  the path was narrow, rocky, rutted with roots, and sloping towards a steep embankment which offered minimal footing, when we finally reached it, to maneuver the canoes into the lake. The only safeguard was a lone tree branch that everyone held onto when making the descent down the embankment. Little Mountain Lake was quite picturesque and the cliffs and forests that rose from its shore created a dramatic effect, somewhat magical  there was a unique sense that time could have easily stood still. The forest shadows and the suns reflections upon the clear water displayed various shades of aqua and topaz into its depths. No one was in a hurry and we slowly drifted towards the portage. Our biggest task now lay ahead of us - we were about to encounter the first (11P950) of six portages to reach Threenarrows Lake. As we climbed to the top of a steep incline, we met two hikers at the intersection of the La Cloche Trail who were heading towards the La Cloche Mountain summit. 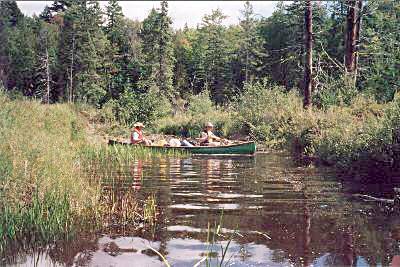 They were returning from Shigaug Lake and had seen us crossing Little Mountain Lake, our green and burgundy canoes reflecting on the aqua water. Our original plan was to hike these two sites if we had the time; however, our portages provided a sufficient hiking experience for the day! 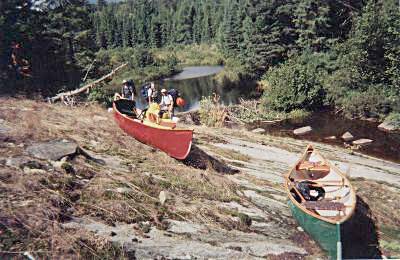 Along the portage, we came upon moose and bear dung and we readied ourselves in the event of an unwanted encounter. We had a pleasant return hike to retrieve our canoes  refreshed by a cool breeze with the suns rays penetrating through the forest trees and down upon its floor; the entire area brought to life with the sounds of various species of birds  a vital component in understanding the wilderness. The trail ended with a steep descent into a muddy, wet marsh that was ideal for moose habitat. The shallow waters allowed only one of us in each canoe to transport small amounts of equipment to the other side at a time. 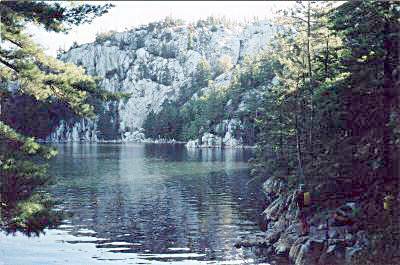 The view of the La Cloche Mountain summit, with its reflection on Kirk Creek was "breathtaking" - we were in the heart of Killarney Provincial Parks eco-region. The second portage (12P950) with its rolling terrain, plank bridges crossing over wet areas, and its descent to an open grass area next to Kirk Creek proved less difficult. After reviewing the map and taking note of the suns location, we followed the twisting, but quiet stream through a gentle valley. 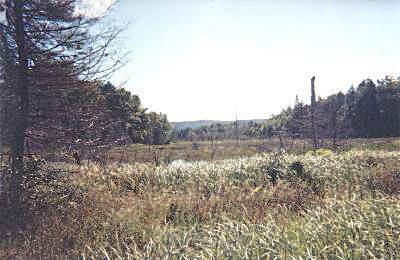 Meandering through a beaver meadow among tall grass and scrub trees, we had to portage over three unexpected beaver dams (BD 5, 6, 7). We enjoyed this part of our journey because we were not on a large lake paddling against winds and waves. There was solitude here as we slowly paddled forward, not knowing what to expect around the bend  our next obstacle would be a logjam (13P35). A short distance further, we portaged (14P75) around a waterfall where the slanting rock and pathway made everyone cautious as we carried our loads. The water gingerly converged over its boulders at the foot of the waterfall and we could imagine the spring run off cascading with greater force and turbulence. As we scraped through overhanging branches and noted chewed tree limbs along the unusually high water level of the stream, we knew that another beaver dam (BD 8) was ahead of us  we were not disappointed! At the end of the wetland, we could not locate the portage (15P45) sign because it had been removed from the tree; this required some scouting on Waynes part before he located the path and we were on our way again. Leisurely paddling through the narrow waterway, we watched as nature unfolded before our eyes - a high cliff just created for a panoramic photograph! Two unexpected portages (16P40 & 17P50) had to be undertaken because of low water levels  Norm R. could be heard singing "in and out, in and out", referring to the many stoppages along this short passage. 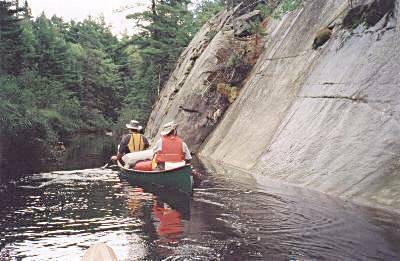 Our last portage (18P130) was around yet another beaver dam, an impassable stream and a waterfall  the paths slippery, slanting rock surface and clay mud banks forced us to gingerly maneuver our canoes between trees and lift them high over protruding rocks. We were thankful for the work of the beavers because without them, water levels would have been much lower, perhaps to the point of being impossible to maneuver. We paddled out into a bog with logs and stumps submerged everywhere that required tacking left and right to avoid getting stranded. We consulted our map regularly and carefully as we passed by several peninsulas and islands along the windswept channel. Occasionally, we coasted silently to let our eyes explore and come to terms with the scale of this astonishing and exhilarating landscape. Near the end of the southeastern channel, we turned northward through another intertwining channel that protected us from the blustery winds and rolling waves as we headed towards Threenarrows Lake. Again, we were treated with several panoramic views that were becoming so characteristic of the park. With only two campsites available on the main part of Threenarrows Lake, we decided not to venture to Doris Island as planned because the lake was heavy-laden with headwinds and whitecap waves. Instead, we paddled out of the channel to the middle of the lake against the high waves and troughs and then tacked towards the safety of a cove next to our easterly campsite (3 Site 52). The areas for pitching our tents were small and well rutted with roots and stones we knew that a good nights sleep would be difficult. Undeterred, we immediately set up camp and then went for a swim and washed dirty laundry. As we relaxed before a warm campfire and indulged in a "medicinal sip" of Yukon Jack to ward off the chill, we rehashed the events of the day and all the adversity experienced during the portages.